Wow. Just wow. This was a novel that makes you say just that word when you finally turn its last page. It’s that good. There, There, written as a first novel by Tommy Orange, a Cheyenne and Arapaho author, is a muscular narrative that weaves together the disparate stories of a large group of Native Americans (First Peoples) who all live in the same city of Oakland, CA. They don’t all know each other, but as the plot progresses, their lives overlap as they each plan to attend the annual pow wow in their community. It’s an “easy” read (in terms of the experience reading as smoothly as “a hot knife through butter” type of thing), but the story is high impact in terms of that it doesn’t shy away from the tough issues of life: depression, alcoholism, unemployment, fetal alcohol syndrome, hopelessness, not to mention life in poverty and as a marginalized indigenous person. You’re from a people who took and took and took and took. And from a people taken. You’re both and neither. In the bath, you’d stare at your brown arms against your white legs in the water and wonder what they were doing together on the same body, in the same bathtub. So it sounds like a dreadfully depressing read, and although it addresses these issues, the plot introduces you to each of the characters one by one. You get to know these individuals as humans with lives and hopes of their own, and it’s easy enough to keep each character straight. So, this book follows a group of characters, all individual but inter-related (at least by the end of the book) and who all decide to attend this community pow wow, an event where life undergoes a sudden and significant change for all. A seriously great read which will take your breath away. It’s not an easy read, but it is a good read. It’s hard to go astray with any of the titles in the book series, “The Best American FILL-IN-THE-BLANK”, usually published each year and edited by a notable author who curates all the selections inside each edition. There are books that celebrate travel writing (see 2000 [Bill Bryson], 2011 [Sloane Crosley] and 2016 [Andrew McCarthy*]), science and nature writing, short stories, and others and although they have a tendency to be heavily rich white male in their offerings (through design or accident), you can usually steer your way through that by your choice of who the book editor is. For example, this one was edited by Amy Tan which, to me, ups the odds of there being a more diverse selection of writings inside. All that to say, I enjoyed this anthology and Amy Tan’s selections. As with any collected volume of works, there are going to be some hits and misses, but on the whole, this was a good selection of writing and a good read. Tan has curated a collection that’s pretty evenly split between male and female authors, but for some reason, it’s heavily swayed towards white people (16 out of 21 stories had white authors). This has got me wondering whether this emphasis on white authors is primarily because most of the stories that the guest editor in question is going to read (or find) are those from authors who have already published their work (in literary journals and/or similar). I don’t know, but just thought it was interesting to ponder for a while. What do you think? Back to the book: Diversity-wise, this anthology included work from a Dominican-American, someone who is Chinese-American, an Indian-American, a professorial type from Tibet (now living in the US), and a guy from Bosnia (now also living in the US).) Perhaps I should be wise to remember that the title of the series is the “Best American….” !! Of the stories that I liked, I thoroughly enjoyed the work of Lorrie Moore (whose work I will be searching for more to read), and then I thought that the others were all a bit same-y in the end, although they were a nice same-y. Therein lies the biggest problem for me with regard to short stories: since most tend to be generated either during or after going through grad school writing programs, the authors are taught to write in a certain way to get the “A” grades, that certain way being determined by the students’ professors who also have previously also spent their time in the grad school engine and so it’s a big self-feeding circle in the end. I could be wrong with this pondering, and this is not to say that I didn’t enjoy the read. I did, especially when I was exposed to very different authors than my usual choices. Perhaps that was what was challenging: that some of these stories were very different in both structure and form than my typical fare. And yet, I’m usually ok with post-modern endings, inventive structural decisions and other experimental offerings. That I finished the whole book would support that I enjoyed the majority of the read. I’m just contemplating what my expectations were in contrast with the final product. Whatever the reason(s), in the end this was a thoughtful read that led me down plenty of other rabbit holes on-line. It’s always good to learn, and this title certainly helped to expose me to different authors and approaches. There was a recent confluence of Mister Rogers in life the other day when I happened to pick up a small book of his sayings and also watch a PBS special on Mister Rogers’ Neighborhood around the same time. I didn’t grow up with Mister Rogers (although I would have liked to), and didn’t come to him until I was in college, but regardless of how you are/were when you first met him, Mister Rogers was an American hero in many ways. Mister Rogers began working at WQED, Pittsburgh’s public television station, and developed puppets and music used in his programming, and when he wasn’t working full-time at the TV station, Rogers was studying theology at Pittsburgh Theological Seminary. He wasn’t interested in preaching, so upon his ordination, he was charged with continuing his work with children’s television. I’ve been reading, as per usual, but not with the usual abandon, I’m afraid. My injured eye is *still* bothering me, and I’ve been ending the day resting it more than usual. It’s really been rather a bane to my existence, but in the big scheme of things, it’s manageable in the end. Plus – my doc and I are making progress, so I’m hopeful that this is temporary. Anyway, so life has been moving a bit slowly, but the vision issue combined with the lassitude of late summer makes for not many blog entries about books read. For the two that I have recently finished up, they were good reads, but not astonishingly fascinating enough to write book reviews. To wit, here are two mini reading reviews. As always, these tiny review-lettes don’t necessarily mean that the titles were bad. Sometimes, you can have a good read and still end up with not much to say, so they fall into that category. This was a reread to get another title into the ongoing Century of Books and was quite fun. It’s a collection of newspaper columns written by Struthers and describing life for her and her family during the outbreak of World War II in England. Fairly lightweight covering topics such as buying a diary and going to dinner parties, this was more a palate cleanser than anything. If you have a Monkey Mind and need something to read that you can pick up and put down with ease, this would fit the bill. This was a good read, despite the gamble of rereading, and did remind me of how hard life would have been at that time and how easy life is nowadays. Plus – epistolary. Swoon. The structure of our life — based as it is on the ever-present contingency of war — is lamentably wrong: but its texture, oddly enough, is pleasant. There is a freshness about, a kind of rejuvenation: and this is largely because almost everybody you meet is busy learning something. Whereas in ordinary times the majority of grown-up people never try to acquire any new skill at all, either mental or physical: which is why they are apt to seem, and feel, so old. A domestic novel that’s fairly straightforward in its narrative arc, this was a fun non-challenging read. (Plus – off the TBR.) It’s about a female fine art photographer who leaves NYC to live in a rural village, rents a slightly tumble-down shack, meets village residents, and a bloke, and it all runs smoothly from there. Nothing too strenuous, but just a nice fairly easy (I might say even cosy in a way) read. I’m also in the middle of some pretty funny essays collected together in a book called “I See You Made an Effort” by comedian Annabelle Gurwitch. Gathered around the theme of aging and reaching the milestone birthday of 50, it’s an entertaining E-Z read that has some sly wit in it every now and again. So nothing too mind-blowing. More of just pottering around, really. Life is good… I hope yours is as well. A delightful memoir of a childhood growing up in the Forest of Dean with a family close to the poverty line – perhaps poor of money, but rich in other ways (but that’s not much good if you’re cold and hungry though….) Anyhoo, this was a really sweet and poignant collection of autobiographical memories for Winifred Foley, and almost made me cry. Along the lines of Cider with Rosie (pre-blog) but a bit tougher of a childhood, I think. The author has a very sly sense of humor which frequently made me smile. And by golly, I’m determined to finish Arnold Bennett’s Anna of the Five Towns this week. It’s been a few weeks on this one, and I just need to devote some solid reading time to it. Also about growing up in a small town up in the Potteries in England (but this is set later on in childhood, really). I’m enjoying it, but just piddling around with this read. More to come. How’s your reading life coming along? A literary friend of mine lent me this rather fascinating coffee table book featuring the role of black (African American) pioneers in the old cowboy Wild West. As I’m really interested in learning more about the African American experience, this book ticked most of the boxes that I look for in a good read. As it’s more of a coffee table book, it’s concentrated mostly on photographs of the sometimes anonymous women who were living the pioneer life at the time. Generally speaking, I don’t see much focus from many people on the life of African Americans during the late nineteenth century as America traveled west across its new territories, but they were there just as much as The Little House on the Prairie family were. (Above) – Stagecoach Mary (Mary Fields) was the first AfAm postal carrier in the county. Many freed slaves had little experience apart from working on the land or helping in a domestic role, and once freed, African-Americans (as a group) were intent on getting an education, both for themselves and especially for their children. Literacy was the key to freedom and success, and these families were typically much more educated than the other groups out on the frontier (whites, Hispanics etc.) and their school attendance was at a notably higher level. Former slaves knew and understood the important of knowledge, and so were determined that their families were going to be schooled. An African American woman used to own all the real estate in the area now called Beverly Hills in LA. In OK and other states, the newly freed slaves joined up with local Native American tribes (although initially the Native Americans embraced slavery as much as the white people had), and in the late 1800’s, 18% of Cherokees were AfAm, and 14% of Choctaws were AfAm. The Native Americans had been introduced to the slavery concept by white people who wanted to make sure that the tribes would not harbor runaway slaves. Most tribes ended up embracing slavery, except for the Seminoles who had a fascinating overlap with the Buffalo Soldiers. One of the earliest settlements of AfAms was in Mercer County, OH, in 1832. Stagecoach Mary (Mary Fields) (photo above right) was the first AfAm mail carrier in the US, and drove a horse and wagon (not a stagecoach) on her route in the wilds of Montana. She wasn’t an employee of the US Postal Service, but had bid and won a contract to deliver mail as she was the fastest person who would drive a team of six horses. She never missed a day of work, and if there was deep snow, she would put on snowshoes and deliver the mail sacks on her back. What I found to be most interesting to read was the common thread of how AfAms thrived in spite of the awful conditions and in spite of how challenging life was. Families had few resources, but they still came west. I wonder just how much more successful AfAms would have been if there’d be a stronger support system for them. There was the Freedman’s Bureau, but it was decades before the idea of ending slavery became common place and widely accepted. The sheer doggedness and determination of these AfAm pioneers is astonishing to me, and I wish their stories were told more often. So I’ve been reading, but there seem to have been one or two titles which are good but not quite enough to warrant an individual blog post. Honestly, I don’t think it’s the books’ fault so much as it is the reader’s in each case, so don’t think these books are less worthy or anything. It’s mostly a time thing at the moment. A Long Way Home – Saroo Brierley (2015). This is an autobiography written by a young man who grew up very poor in an Indian city and who, one day when he was only five years old, was playing on the train tracks with his older brother when he accidentally got locked into a railway carriage and was whisked away across the country to Mumbai, where he was put into an orphanage and then adopted by an overseas couple. This tale is how, by overcoming all the odds, he found his way home again. (This is the book that the movie Lion is based upon, btw.) It’s a fantastic story – that’s true – but I think the read would have been better if he’d used a professional ghostwriter (or editor) to up his writing game a bit. It was well written (in that there were few grammar errors etc. ), but the level of writing was rather fundamental and rather clunky at times. Still a good story though. It might be better to watch the film than read the book. I had recently been playing around with my Century of Reading (COB) project, and wanted to find a title that would help fill in some of the remaining blanks (not many really). So I searched for “books published in 1916”, and wanting a more esoteric title and something that wasn’t 500 pages long, picked out a play which seemed to fit the bill. This play (which I’d not heard of before but I’m not a dramatic expert by any means) was interesting and is actually one of those stories that stick in your head for ages after you’ve finished it as you mull over the various interpretations of how it could be read (or played). Set out in the country of somewhere like the Midwest, the narrative revolves around the death of Mr. Wright, a farmer who lived in a remote house along with his wife (obvs. called Mrs. Wright). The local sheriff and a deputy are searching the home for any clues after learning that Mr. Wright had died by strangulation. Was it a murder, and if so, who did it? They are all unsure how to explain the crime until the women find a dead canary…. Chosen off the TBR for being a classic, Beloved was a good read although quite challenging in some ways. The beginning of a trilogy* set by Toni Morrison, the book is based on the history of an African American slave, Margaret Garner, who escaped slavery in Kentucky in 1856, although I’m not sure how much creative license has been taken by anyone. I haven’t read any of Morrison’s work before, so had little idea of what to expect but loved it in the end. It’s not the easiest work to read and you have to concentrate on the plot and the characters (or at least I did), but the effort is so worth it at the end of the day. Just be prepared for quite a ride, reading-wise. This is one of those books where the reader may need to work a bit at the story, but in this case, it’s so worth it. If I was going to compare it, I would pair it with “Their Eyes Were Watching God” by Zora Neale Hurston. I loved this on its own rights though, and I think you will as well. I had no idea that Beloved was part of a trilogy. In case you’re wondering, # 2 is Jazz (1992) and #3 is Paradise (1997). “Wild Geese” – Mary Oliver. 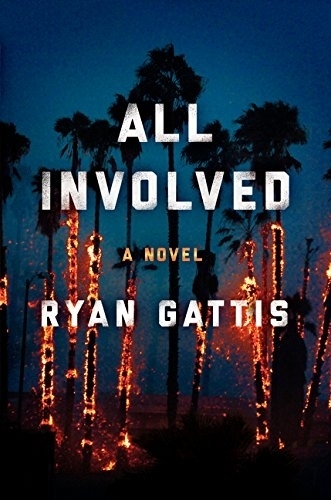 So as the story progresses, the reader sees the events play out through the eyes of various gang members, through a firefighter, through a nurse (receiving the injured at the ER), and through the friends and other contacts of these characters. It’s well done, and I found it drew me in and had me reacting in the immediate present as the riots built up to a crescendo and then wore out. It’s quite the ride, and I enjoyed it. The only thing that niggled me was that Gattis is a white guy, but he wrote through the eyes of several people of color (POC), and I’m just not comfortable with that. How can a white privileged guy know what it’s like (really like) to be a socio-economically disadvantaged gang member in East LA? To the author’s credit, he does acknowledge having talked to numerous sources to get their experiences, but really, at the end of the day, I think it’s a tad awkward for someone in his position to pretend to “know” what life is like for someone from a very different background. And it’s not just one character, either. It’s character after character, which just seemed to be a large assumption on his part. However, is this the perspective of a similarly privileged white woman who might be over-sensitive about the issue? It just seems that it’s presumptive to write through the eyes of someone of a different race when the whole incident around which the plot revolves is a racial issue (which the Rodney King riots all boiled to in the end). But then again, it is classified as fiction and I’m not grumping about anyone writing as a vampire when they clearly haven’t ever lived their life as a vampire. I’m not sure. I just think it’s a little insensitive (for a white man) to co-opt Latin@ and African American characters at a time when race is such the hot-button issue that it is right now. What would you think? But – good read all the same. Various reviewers on Goodreads have compared it to the TV series The Wire, but I think that that was a much stronger end product than this.